Why does it matter if I put a tiny amount of a “safe” chemical on my skin? If you are a Gypseed follower, you already know that your skin is your body’s largest organ. An adult’s skin makes up 7-10 pounds of total body weight and has an average area of 22 square feet. Your skin’s role in overall wellbeing is reconfirmed by its size…., huge! Our skin literally prevents us from evaporating, remembering that our body is nearly 60% water. This outer “packaging” layer is also our sentinel wall against microbial invaders including bacteria, viruses, fungi, as well as environmental invaders like harmful UV rays, pollution, or chemicals. Overall, your skin performs the functions of waterproofing, insulating, cushioning to protect internal organs, sensory instrument (hot/cold, hard/soft, sharp/dull, affection, sexuality, etc), excretion of waste & water, transportation manager (what goes in/what goes out), and manufacturer (repair, growth, & Vitamin D for bone building). We often overlook and under-appreciate the complex function and structure of our skin. We’ll go back to structure and function in many future posts, but for now, let’s focus on the question at hand, Why does it matter if I put a tiny amount of a “safe” chemical on my skin?. To answer that question we have to start with the fact that your skin does have the power to absorb what you put on it. There are 3 different pathways that enable your skin to absorb chemicals: diffusion in between your skin cells (intercellular), diffusion into your skin cells (transcellular), or diffusion/absorption through hair follicles, glands etc. Nicotine patches, hormone patches, or pain medication patches are obvious examples of our skin’s absorption ability. Now enter the over $35 Billion cosmetics industry. Did you know that the cosmetics industry is not controlled by the FDA, the FDA does not approve cosmetic products to be sold, nor does it approve the ingredients that go into those products. The FDA requires cosmetics to be labeled properly, which prohibits companies from making wild claims about their products, and prevents the consumer’s confusion between cosmetics and drugs. Products such as antibacterial soaps, acne medications, sunscreens, dandruff shampoo, are actually considered drugs and are therefore regulated by the FDA. The FDA’s role in cosmetics by and large, ends there. The cosmetic industry is actually “self-regulated” by a group called the CTFA (Cosmetic, Toiletries, and Fragrance Association), which is made up of the individuals who manufacture or distribute cosmetics. This was one of the most shocking aspects of this business when I began my career 20 years ago. Let’s talk facts. In 2004, the Red Cross randomly collected the cord blood from babies for a study by the Environmental Working Group (EWG). These were newborn babies, fresh from the womb and a random socioeconomic sampling. 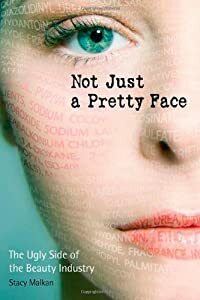 In Stacy Malkan’s fantastic book Not Just a Pretty face, she writes about this study, two independent laboratories found “287 different chemicals in these babies’ cord blood, including 180 chemicals that cause cancer in humans or animals, 217 that are toxic to the brain and nervous system, and 208 are known to cause birth defects or abnormal development in animal studies.” Earlier this year, the U.S. Center for Disease Control published the Fourth National Report on Human Exposure to Environmental Chemicals, Updated Tables, March 2013, which contains data obtained by the analysis of blood and urine from thousands of Americans. To date, more than 200 chemicals have been detected and are being quantitatively monitored, including 34 new chemicals. Most of these chemicals are known to pose health hazards to humans and animals. How do these chemicals get into our bodies? We breathe them in, eat & drink them, and slather them onto ourselves and our families. How does this happen? How are we exposed to so many chemicals, when we have agencies that police these issues? Well, first of all, every day the U.S. produces or imports 42 billion pounds of chemicals. The short answer to our exposure question is that there is not one agency that is focusing on the comprehensive perspective of our exposure. If the average American woman uses 12 personal care products daily, the average American man uses 6, and each of those products contains a minimum of 11 different synthetic chemicals, then we are all rubbing, spraying, and rolling on a minimum of 60 to 120 chemicals daily. A report published in the Daily Mail UK states that a study revealed the average woman was actually applying over 500 different synthetic chemicals everyday. If a “safe” level of a chemical is added to a product that we use, for example at 1%, and we were only using one product, perhaps that “safe” chemical exposure would not be a big deal. However, when we are consuming products over and over, and we’re using so many different products from personal care to cleaners to food to air fresheners etc., and wearing clothing that has been chemically treated, shoes made from chemical laden polymers, sitting on chemically treated upholstery and carpets, pulling the chemical shower curtain around our body and breathing in its volatile chemical compounds, smog, exhaust, preservatives, and so on, and so on. It becomes quite clear to see how our exposure adds up. Another staggering aspect of the U.S. cosmetics business is that this self-regulated industry has a whopping 10 chemicals which are banned for use in cosmetics. The European Union has 1,200 banned chemicals for cosmetics. Furthermore, a study a few years ago revealed that in testing 17 popular cosmetic products, 14 chemicals were found that were not disclosed or listed as ingredients. What does all of this mean for your health and for the health of your family? We don’t really know. We do know that these chemicals that we all have in our bodies, are brain and nervous system toxins, are capable of creating birth defects, are hormone disrupters (can mimic or block hormones), cause infertility, are known carcinogens, cause mutations, can cause organ damage (kidney, liver, lung etc), and many more. There are numerous recent studies linking our chemical exposure not only to cancer, but also to juvenile diabetes, endocrine disorders such as Cushing’s and hyper/hypothyroid, obesity, autism, autoimmune diseases, ADD/ADHD, and this list goes on as well. I think it’s safe to say that eliminating chemicals from our lives is impossible, but limiting our exposure to harmful chemicals is absolutely necessary. Limiting our chemical exposure through our personal care & cosmetic products is a GREAT place to start, and it’s also one of the main reasons why Gypseed does not have a single synthetic ingredient. Wow, I’ve seen some of these stats before but putting them all together like this is shocking. I don’t hear a lot about how here in the UK we stand in regards to this stuff, I’ll have to do some more research but I would much rather just be safe and make all my own skincare these days. It doesn’t seem worth it to cover myself with that much rubbish. Great post.